Healthy Shrimp Tacos – made with a delicious spicy seasoning and come together in under 30 minutes – perfect for your next Taco Tuesday! Best of all, instructions to make this on the grill or stove and packed with avocado, lettuce, red cabbage, pineapple and avocado cream. It’s another TACO Tuesday and quite possibly my family’s favorite day of the week. My family is obsessed with anything Mexican inspired so I am always trying to switch things up. 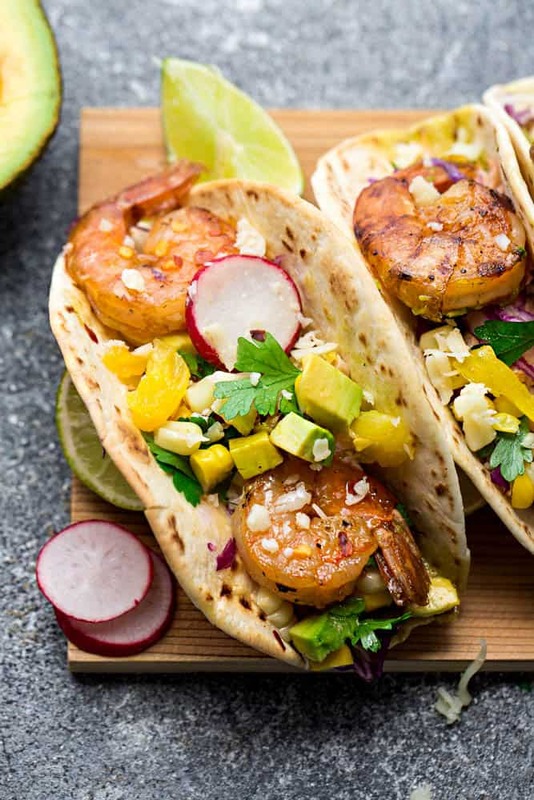 These Healthy Shrimp Tacos are fresh, flavorful and perfect for summer when you’re craving something lighter and healthier. 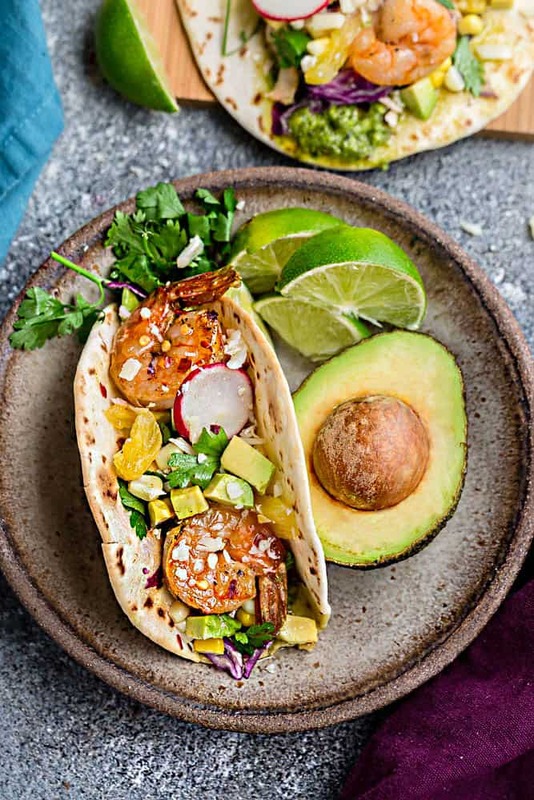 They come together in 30 minutes so you can make these healthy tacos on a busy weeknight, lazy Sunday or just anytime you’re craving some tasty Shrimp Tacos. What I love about shrimp is how quickly they are to make. You can pan-fry them on a skillet or grill them out on your barbecue when it’s too hot to turn on the oven. You start off by seasoning the salmon with salt, pepper, chili powder, paprika, lime juice and garlic powder. While the shrimp is cooking, you can prep and chop the vegetables and make the avocado cream. 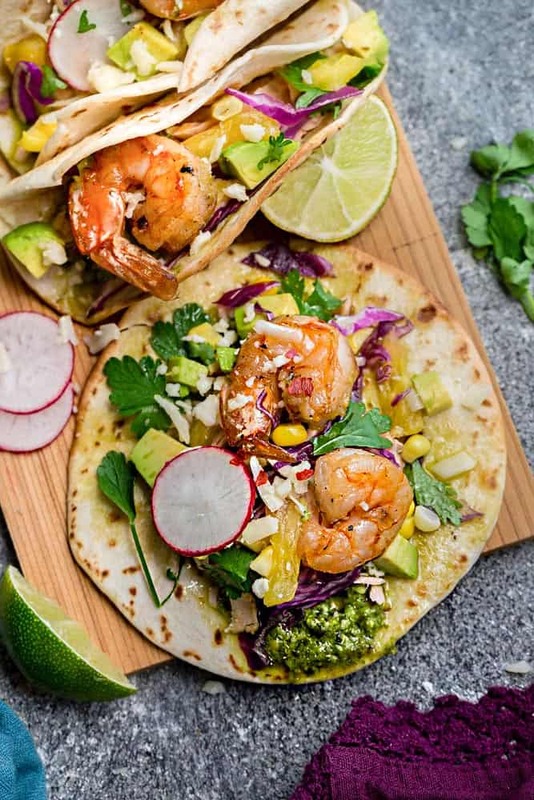 Char or broil the tortillas and assemble with lettuce, red cabbage, pineapple, avocado, cooked shrimp and fresh cilantro. WHAT OTHER TOPPINGS GO WITH SPICY SHRIMP TACOS? 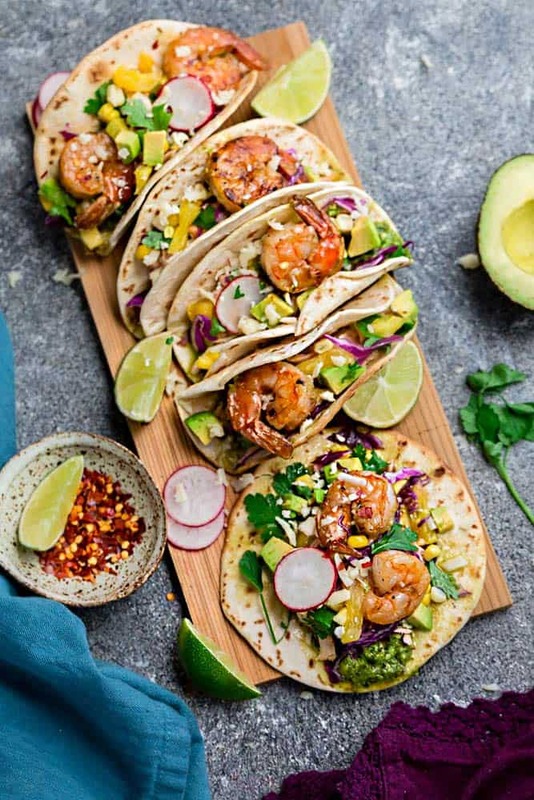 Spicy shrimp tacos are so versatile and would also go well with some mango salsa, avocado salsa, diced tomatoes, chopped red onions, guacamole – feel free to go crazy and get even more creative! No matter what you decide to top these delicious tacos with, they would be amazing for lunch, dinner or as an appetizer for your next summer party. 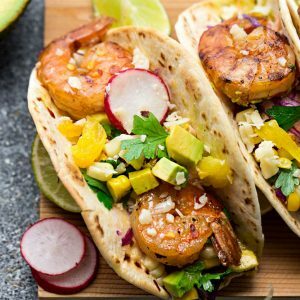 CAN I MAKE THESE HEALTHY TACOS WITHOUT SHRIMP? Yes, absolutely! You can leave out the shrimp and use salmon, steak or go meatless if you prefer. Roasted Cauliflower, tempeh, tofu or sweet potatoes would work as well. Healthy Shrimp Tacos - made with a delicious spicy seasoning and come together in 30 minutes – perfect for your next Taco Tuesday! Best of all, instructions to make this on the grill or stove and packed with avocado, lettuce, red cabbage, pineapple and avocado cream. In a large bowl, drizzle the shrimp with 1 teaspoon olive oil. Season with salt and pepper then sprinkle with paprika, chili powder. Toss to coat evenly and allow to marinate while you prepare the toppings and avocado cream. Add the avocado, yogurt, and lime juice in a high speed blender. Blend until smooth. Add water as needed, to thin out sauce. Season with salt and pepper, to taste. Heat a large non-stick skillet on medium-high heat. Add the remaining olive oil and swirl to coat pan. Add the shrimp and cook until pink and opaque and just cooked through - about 4 minutes. Transfer shrimp to a plate and add a squeeze of lime. Preheat grill to medium-high heat. Clean and brush grill lightly with oil (using long tongs with a paper towel). Place shrimp on grill and cook until just opaque, about 1-1/2 - 2 minutes per side. Cover to keep shrimp warm. Char the tortillas on a gas stove or broil in the oven until the edges are lightly burnt. Fill each tortilla with avocado cream, lettuce, cabbage, avocado, pineapple, shrimp and cilantro. Serve with radish slices and extra lime if desired. Mexican food is always a big hit in our house too! It’s so fun how much variety there can be and how easy it is to pull it all together.